In most music composition systems you have multiple tracks. Each track may represent an instrument, a sequence, an effect or an automation sequence. The trick is to balance each part of the music composition so that it sounds best. In most music composition systems each track will be represented in the Mix with its own set of controls. The basic controls are of course Volume and Panning. Volume to prevent any track from overpowering the rest or conversely to bring the main instrument into focus. Panning gives music much depth and refers to the stereo position of each part in the Mix. This can be controlled in a stereo environment by moving the Pan control so that the signal is routed proportionately to the left or right audio output. Some music development systems offer built-in effects such as reverb for each instrument. All of these nuances affect the finished product. The object of mixing is to create an audio file that sounds right and can be distributed to be played by common media players. 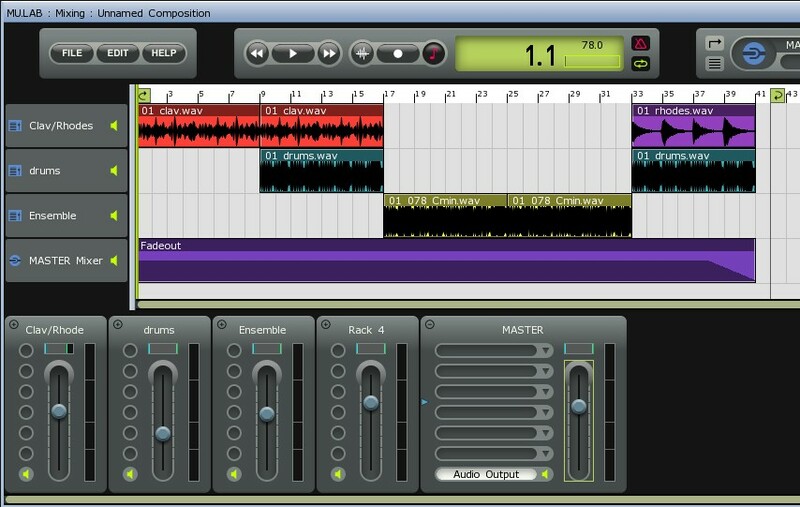 Using a Digital Audio Workstation will create multiple tracks that are each processed separately. Placing them together and balancing the overall presentation is what mixing is all about. In this tutorial we will be just scratching the surface, but will present some features that can get you started on completing a musical piece. For simplicity we will take some ready made loops and assemble the pieces into a single musical piece by mixing the pieces together. The loops used here are WAV file samples that were distributed on the June 2006 CD of Future Music Magazine. They are royalty free samples that were created by Big Fish Audio. The loops were recorded at 78 BPM, so one of the first things to do is to set the tempo to 78 BPM. Note: Since we are not mixing any MIDI or time sensitive tracks, the tempo setting is not too important, since the WAV files will be played back at the recorded speed. By setting the Tempo at the recorded speed it is easy to find when loops begin and end (on 8 bar sections). These Audio files are called loops because they begin and end on a bar boundary at a given tempo and can be easily integrated e.g. there is no hesitation or glitch at the beginning or ending of the loop and they can be played using the looping features of a DAW. Download them and place them in your MU.LAB Free folder (or any folder that you want set up for storing WAV Samples). - Listen to a few samples and loops to decide what goes together and how it can be made to sound decent. - Pay attention to the BPM for each sample loop, if you are using recorded licks. - Each loop was loaded to a separate track using the techniques discussed in prior tutorials. Audio Loops can be placed anywhere, on any track, but eventually you must consider a Rack to handle Volume and PAN. - To add a loop, use the pencil tool and drag an approximate size for the loop. When you release, select Audio and browse for the loop to be loaded. - For clarity, each clip can be named and colored. Color is chosen by clicking on the Color Square (upper right corner of the Composer window). - Assign each clip to a Rack strip. (The default for most Audio clips is straight to the Audio Output). Now comes the iterative part. Play the mix and decide where each track fits best and which parts need to have separate levels and/or need to be panned. Recorded licks are usually pre-adjusted for this, so there may not be much need to mix each individual track - or assign each track to a separate mixer strip. If the samples are not up to par, the next step is to add a few effects to the Mix. For clarity and brevity, this example uses no effects. (Some effects were obviously used in recording the audio samples to begin with). Note: There are many ways to create a mix. We could just as easily had several sequences that are routed to VSTi mixer strips which also must be balanced mixed with several audio files used as a background. Each audio file was used in its entirety. Each unique clip was placed on its own track for ease in handling, but clips can be moved anywhere in the composition. Simply place the cursor over the clip and find a position where it becomes an arrow. Then drag the clip to a new starting location. To adjust the length of the clip at either end, place the cursor near the end of a clip, it will become a pencil and then you can extend or shorten either end of the clip. The start point can be very precisely specified (see Advanced). To copy a clip into another position in the mix, make sure that the cursor is an arrow. Press the CTRL key while dragging the clip to the new position - the original clip will remain where it was. The copied clip retains all of the properties of the original clip. Note: In the example above, a Fade out was sequenced by adding an extra track consisting of a sequence of Midi Volume signals that were sent to a separate Rack (named Fade) that also received Audio streams from the tracks to be faded. However a Fade can be performed just as easily in an Audio Editor after the the Mixed WAV file has been created. This is where it counts, but is one of the easiest parts of creating music to accomplish. The term rendering is used to mean capturing the sound you hear into an audio file that can be reproduced. In almost all cases this means creating a single .WAV or .AIFF file that is at least 44,100 hz and 16 bits and most likely in stereo (two separate tracks in one file). In many cases, this is dependent on the hardware and software capabilities. Many audio musicians like to master at a higher frequency and bitrate e.g. 48K x 24 bits or sometimes as high as 192K. But for a home studio production, CD Quality (44.1K x 16bits) is quite good. 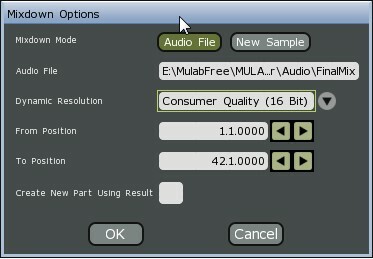 MU.LAB does not offer a choice and will output a CD quality stereo audio file. Once you mix is satisfactory, save the session, so you can reproduce all of your efforts. Click on the FILE button and select Save session as. It is probably wise to save the session under a new name, so that you can get back to a prior mix, if need be. Caution always means making an extra copy. Once the session is saved, make sure that none of the clips are selected (Double-Click in the grid outside of all clips). MU.LAB will render just those clips that are selected. If none of the clips are selected, MU.LAB will render the entire composition to a WAV or AIFF file. CAUTION: If you are using a midi hardware synth, you will hear this in the mix, but the output from the midi hardware does not pass through the mixer strips and will not be included in the rendering process. To include this track (or tracks), the output from the midi hardware synth must be recorded as an audio track and added to the mix. (Covered under Advanced). With no clips selected, click on the FILE button and select Mixdown to Audiofile. Choose a file folder and a file from the explorer or click new file and enter a name for the audio mixdown. When you click OK the mixdown will occur and may take a few seconds to convert your project into an audio file. Once the file is created, you can use almost any media player to play it; You can burn it to a CD; or convert it to MP3; or to any other format that is needed. Note: The example in this tutorial was Mixed to a WAV file in MU.LAB and then the file was loaded into Audacity and converted to an MP3 file. Audacity can be used on both the PC and in OSX on the MAC. It also has features for touching up your final mix such as Fade In, Fade out, compression, etc. Quite a useful companion program to MU.LAB. MU.LAB offers the capability of selecting a specific start point within a clip by precisely using the editor. To use this capability, double click on the audio clip to get into the Audio editor. Then select the beginning part of the clip that you will use. Right click at this point and then select start here. A vertical line labeled start will appear. When copying a clip, sometimes it is useful not to retain the properties of the original clip. If this is the case, press the ALT key when dragging the copied clip. The new clip will have its own properties separate from the original clip. The mix is made by routing audio through the mixing strips and setting up controls so that you have enough control over each audio output to balance volume and placement. In some cases, more effects are need to be applied to the overall audio output. The result is an audio file that can be played by standard media players. The Mixdown to Audiofile will create the final result - a WAV file or AIFF file - and can be burned to a CD. Please feel free to leave us some comments about this tutorial by contacting the San Diego Music By Computer group.